Hello my friends! I know it is a day late, but I am hoping that you all had a fabulous Mother’s Day! This week’s MDS Challenge was for our special day! So tell me how you celebrated your day! Mine started with a bit of a headache as we attended a wine tasting event on Saturday night and let’s just say that I tried almost all 100 of them! LOL I was happy to see the sun shining nice and brightly when I woke and could hardly wait to get outdoors and enjoy the day! Got a lot of chores done around the house; mowed the grass, stained the deck, groceries, etc. The later afternoon was spent with Paul’s mom and dad enjoying some awesome steak burgers, scallops, and calamari! All my favorites!!! I hope you all had some special time with your families or some alone time if that is what you preferred! Share your mother’s day with me! Let me know what you did! Here is my contribution to the Mother’s Day challenge! I absolutely love the blue and yellow combination! I chose Marina Mist and Crushed Curry for my project. 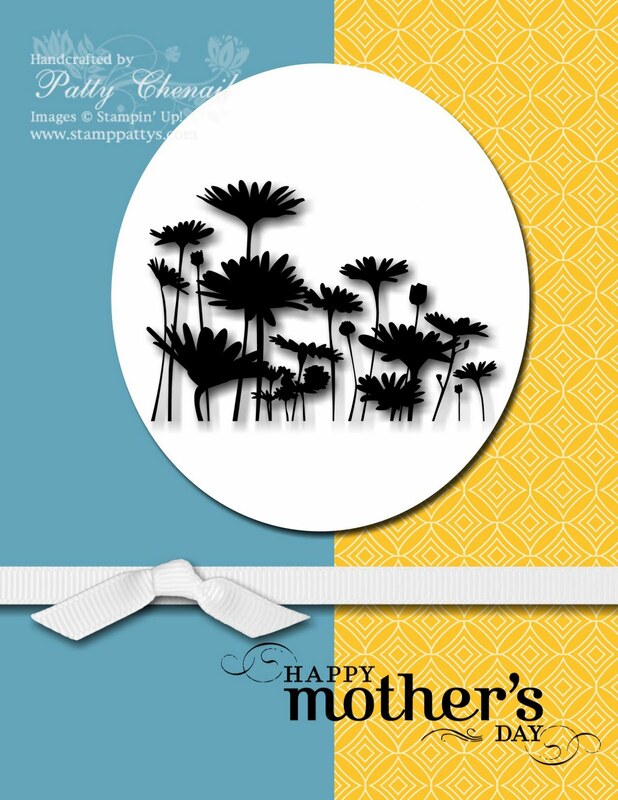 The stamped focal point is using the Upsy Daisy image (shrunk down a bit). Hey Patty! I had a great mother's day! I was given some quiet time and was able to stamp for 5hrs! I haven't been able to ever do that. It was great! I love your card! Thanks for all your inspiration! I could see this card as a tropical theme – big orange circle w/palm tree silouettes inside and tropical colors on the front of the card. I like this one. You could do a lot of variations easily.